Chinese paramilitary police patrol Urumqi in July 2009 following days of unrest in the city. 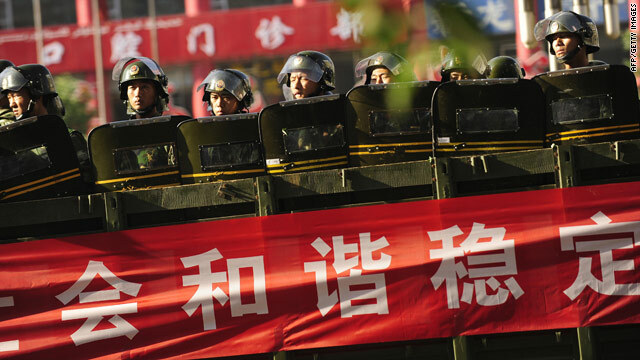 Four sentenced to death were charged with "extremely serious crimes"
A Chinese court has sentenced four people to death for their roles in last year's deadly riots in the western city of Urumqi, state media said Tuesday. The sentences for the defendants were to be carried out immediately. They were charged with "extremely serious crimes," said state-run Xinjiang Daily. The newspaper said a fifth person, who was also sentenced to death, was granted a two-year reprieve. Several others were given varying jail sentences, including life imprisonment. They were on trial for incidents of "vandalism, burning and serious violence," the newspaper said. Urumqi, the capital of the Xinjiang region, was shaken last July when long-simmering resentment between minority Uyghurs and majority Han Chinese erupted into riots and left more than 200 people dead. The following month, a series of series of syringe stabbings added to the unrest.